Zombies! Run! Or Don’t. You’ll Live. What would really happen in the event of a zombie apocalypse? The answer's a lot different than you might think. This just in: Zombies are real. Seriously. They do exist. But they’re not the rabid flesh-tearing, brain-eating monsters pop culture would have us believe. In fact, they look pretty much like what you see in the mirror, albeit a bit more sluggish. To understand what we mean, you have to first understand the folklore from which today’s zombie has evolved. To do that, we tapped Dr. Robert Curran, a world-travelled writer, researcher, and teacher whose expertise on zombie lore runs way deeper than modern media’s obsession with the of-the-moment creatures: He can actually trace the pique of his own interest in zombie folklore, specifically corpo seco (more on that later), to an experience with a mestizo, a shaman of mixed tribal origins, in the jungles of Bolivia. He’s even chatted up locals in New Orleans, who claim to have experienced firsthand accounts with zombies, as well as the cult of bayou cannibals called Le Cochon Gris (or “The Gray Pig”). With a passport loaded with stamps from locales oozing with folkloric mythology, an extensive curiosity that’s led to numerous published works including The Zombie Handbook and Encyclopedia of the Undead, and a stint as a grave digger, Dr. Curran is a zombie Jedi. And with him, we go to the dark side, specifically, West Africa and the Caribbean. This region is in fact where the folkloric zombie was born. “The folkloric zombie appears only in isolated tales, mainly from the Caribbean and South America, although the name itself is probably West African and is often associated with the West African/South American religions of Voodoo and Candomble,” Curran explains. Contrary to today’s mass-produced fictional zombie who’s usually the result of an infectious bite, the real-life folkloric zombie of yore is the result of magic. “The majority of these stories concern people who have been turned into zombies by local magicians, bokors or houngans, in Haiti, who then sell them or exploit them as labor or servants. It is said that they are buried and ‘resurrected’ by the bokor at some future date,” Curran says. Though today the concept of magic is pretty much limited to Hogwarts and the Vegas Strip, for Haiti in the 1880s, it was a real problem. So much so that Haitian Criminal Law outlawed the zombifying process, ruling it murder. “Article 246 of the Haitian penal code, which was passed in 1864, warns against administering substances that can produce ‘a lethargic coma’ or impaired function and employing people so treated,” Curran says. So just what goes into the zombifying process? Well, it doesn’t start with a bite from a rabid monkey, but rather the ingestion of a toxic powder, or poudre, that’s concocted and administered in a ritualistic manner. “This gives the zombie powder and indeed the zombie itself a kind of supernatural aspect,” Curran explains. Throughout history, there’s been only one ever recorded actual zombie. Ever heard of the curious case of Clairvius Narcisse? Narcisse was zombified by his brother, a powerful bokor, because of a land dispute, then sold to a slave owner. But here’s the real kicker: Narcisse died in Haiti in 1964. That’s right, less than a century ago. And now it seems the threat has trickled over into home territory. Not only has our own U.S. Pentagon actually devised a battle plan (okay, so it was an elaborate training tool) to defeat a hypothetical zombie attack, but the undead have become welcome guests in households across the nation. 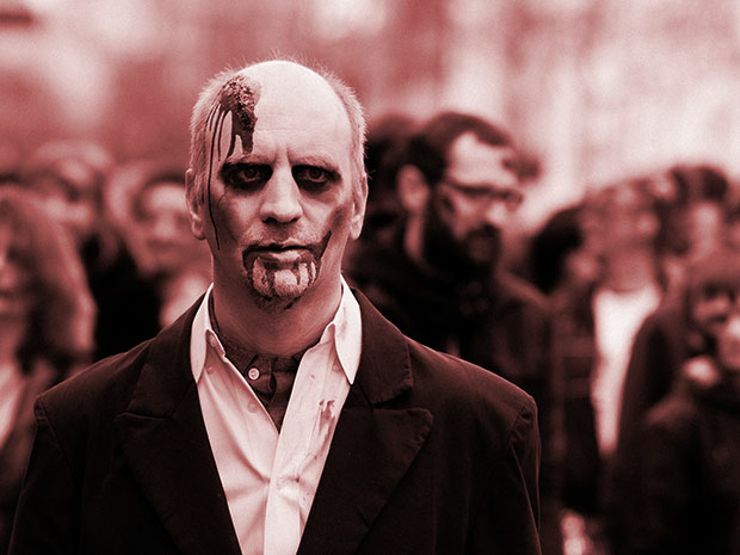 With TV shows like Frank Darabont’s The Walking Dead and the CW’s iZombie sourcing water-cooler chitchat, and countless films staggering out of studios (WWZ, Warm Bodies, Zombieland) and the indie circuit (What We Do in the Shadows, Life After Beth), we’re a society with zombies on the brains. Of course, we know such apocalyptic depictions, complete with walkers made not from ritualistic poudres, but rather too much time in the makeup chair, and peppered with not Haitian locals, but rather chiseled celebrities, are indeed fictional. But also knowing Narcisse was roaming the earth just a few decades ago and that the Pentagon has at least entertained the idea of an apocalypse, we have to wonder: Based on actual zombie folklore, just what would happen should zombies attack? Well, not a whole lot. “Whilst it makes for good television and comics, the overall idea of a zombie army attacking the living is rather remote,” Curran says. His reasoning lies in the zombifying process. “Part of the zombification process, it has been argued, involves the administration of a tetrodotoxin, which in the second stage of the poisoning results in a near paralysis of the nervous system and restricts movement. This would also chime well with the use of curare in the tribal cultures of South America, as the poison causes a gradual paralysis, eventually resulting in death and an impairment of the motor functions.” Hence the idea of corpo seco, or the shambling zombie. Cooking up a real zombie proves quite tedious, so such administration would be limited to individual cases. In other words, on a scale of 1 to 28 Days Later, the idea of a zombie army, or zombie attack, or – as is fashionable these days to say – a zombie apocalypse is highly unlikely. “The idea of an autonomous functioning zombie force simply isn’t possible in folkloric terms,” Curran says. However, there is a possibility of compliant work gangs as described by writer, explorer, occultist, and, yes, cannibal William Seabrook. Seabrook, who died in 1945, made a case for zombies and zombie gangs. Credited with pretty much laying the foundation of how we depict zombies today, Seabrook introduced the idea of the zombie gangs attacking humans in works such as “Dead Men Working in the Canefields,” his essay on Haiti, and The Magic Island, a sensationalized autobiography documenting his Voodoo searches throughout Haiti. “He suggested that there was a cult of sorcerers – The Culte des Mortes – who transformed innocents into zombies and sold them as slaves to various owners or else used them to take vengeance on their enemies. There is no real evidence that such a group ever existed, but the notion of the malignant ‘walking dead’ has transferred itself into our own mythology and forms the basis of many modern fictions, such as the ‘zombie apocalypse,’” Curran says. Such ideas can be traced to late 18th/early 19th centuries in the Caribbean. This, too, may mark the time when cannibalism – or a zombie’s hunger to consume braaaainsss – creeps into the image. Though there’s nothing in folklore to suggest such a craving, the myth does come from somewhere. According to Curran, that place is confusion. But the idea of a zombie being a cannibal is just a perception spread by the white man. “Whilst there’s no doubt that cannibalism did go on in certain tribal societies, it gradually spread in the white Western world, and in America, as a myth concerning black people, to emphasize their primitiveness in Western eyes,” Curran says. According to folklore, zombies don’t have an appetite for human flesh, organ meats, or rubbery brains – raw, cooked, or otherwise. In fact, they eat the same foods you do. So long as they don’t contain salt. “Even the smallest amount of salt will disrupt the poisons, which have caused the condition and will throw the zombie into confusion. At this point, it might become violent, although this is by no means certain,” Curran says. Well, now we know the true death for a zombie. And it’s not an arrow to the heart or a bullet to the brain – it’s a pinch of good, old table salt. “In the event of any apocalypse or social breakdown, we are more likely to be at risk from humans than zombies,” Curran says. We don’t have to worry about the zombies eating us (George Romero). Nor do we have to worry about them outrunning us (Danny Boyle), as the toxins they’re suffering from would prevent such athleticism. And they certainly wouldn’t have the ability to form social groups, or packs, or hipster squads, as depicted in Jonathan Levine’s Warm Bodies. 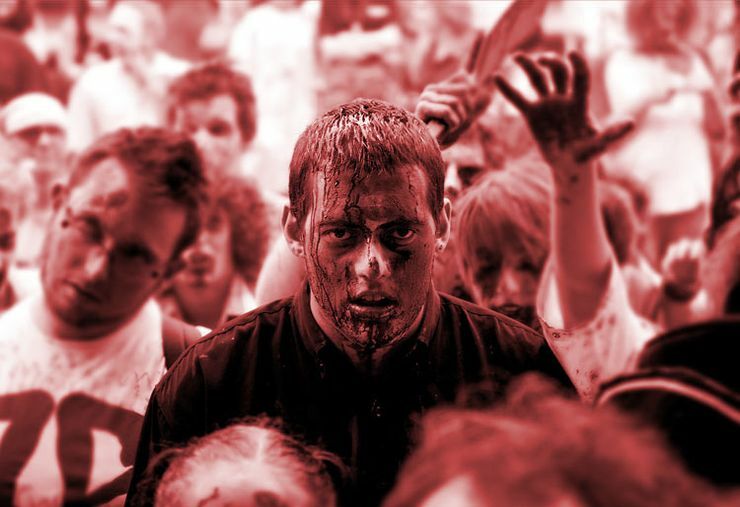 Several zombie theorists claim that areas with dense populations will be the first to go in the event of a zombie attack – that the resources will dwindle, the exits will become blockaded, and the “virus” will spread. So those in mountainous, less populated areas have a better shot at survival. According to World War Z author, Max Brooks, all you need is a Barbell. The house is protected by rounded walls, which utilize the concept of the arch: No matter how much pressure zombies apply to the walls, they can’t get in. There’s a rooftop garden for food. Potatoes, Brooks tells me, are the most sustainable. They can be trampled, and the crop will still yield. So what have we learned? Real zombies in their basic nature don’t have evil at their core or the desire to reduce a civilization to ash. They are humans who through the “magical” powers of sedative medications (antiquated and otherwise) have been stripped of their motivation, cognitive skills, and free will. In this state, they are easily manipulated, incapable of empathy, and pose generally no threat to humans. As much fun as it may be to romanticize and fictionalize the idea of the zombie, Curran suggests perhaps the most appropriate perspective.